A North Carolina teacher read King & King to his third grade class and now it’s a news story. 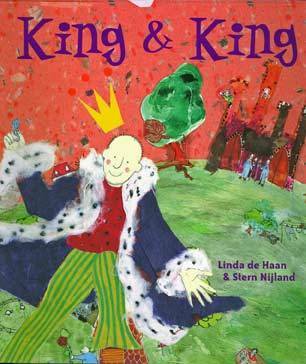 There is so much going on here, but the short version is this: Omar Currie noticed a boy in his class being bullied for being “feminine,” including being called “gay.” Currie (who is gay himself) addressed this by reading the picture book King & King by Linda de Haan & Stern Nijland to the class. Apparently, this worked: the bullied kid felt “for the first time that he was okay just the way he was.” Then he was, of course, in the news because he won all the teaching awards. Instead, the book choice was challenged three times, culminating in a meeting of 200 people. A committee voted that parents must be notified about every book read in the classroom. “Currie says that requirement is burdensome, since he reads his students around 500 books in a 180-day school year.” The school was picketed by a parent whose kids do not attend Currie’s class. I could quote a lot of ridiculous homophobic comments, but I’ll leave it at that. I repeatedly heard from school officials that the book might have been appropriate to read in a more progressive area without parental consent, but in Efland we need time. These comments were made as if to persuade me that today is not the time to stand up and protect students … but that change on all issues must come about slowly, even if the safety of my students is compromised. This was met with applause from most of the people gathered, and the review committee ultimately sided with Currie. He feels, however, that the school district showed very little support, and is considering resigning at the end of the year. Frankly, I’m tired of stories like this. King & King is not a controversial book. It’s about two princes who kiss and get married. It’s about as sexual as Disney’s Cinderella. It’s entirely age appropriate for third graders. It would be age appropriate for a two year old–though maybe a little long. Here’s the thing: queer people are not optional. We don’t appear at a certain time or place in life. We’re always here. If you mean to teach kids about the world, you have to teach them about queer people in the same way that you have to teach kids that people have different religions than you, or different hobbies, or different diets. Otherwise, you’re not protecting kids. You’re giving them false information, which is confusing at best, and damaging at worse. Kids need queer books. Because some kids are queer. And those kids who aren’t will be sharing a planet with people who are. This is not about “sexuality,” it’s about love and relationships. If a teacher is gay, is it “inappropriate” for them to mention their spouse? It is not “age appropriate” for them to mention their family and kids? There’s one question that I’m left with after reading multiple news articles about this. If third grade is too young to learn about “homosexuality,” then how did kids start calling other kids “gay”? Seems like they’ve already learned about it somewhere. Or is the problem not teaching kids about gay people, but teaching them that gay people can live happily ever after, too?